Mumbai: When god created Earth, all he said was, “Let there be light". Voila! There was light, so reads the Bible. Today, believers, agnostics and atheists alike can do likewise at home and in offices with artificial intelligence (AI)-powered voicebots and smart speakers like Google Home and Amazon Echo. HDFC Bank Ltd users, for instance, can simply say: “Ok Google, talk to HDFC Bank" when they use Google Assistant. The bank announced in December 2017 that its AI-based chatbot Eva works with Google Assistant on Android devices. Eva was built for HDFC Bank by Bengaluru-based Senseforth AI Research. Early this month, Kotak Mahindra Bank Ltd announced the launch of Keya, an AI-powered voicebot that is integrated with the bank’s phone-banking helpline. Keya is available in English and Hindi and is expected to augment the traditional interactive voice response (IVR) system. It uses natural language processing (NLP) and text-to-speech technology, enabling it to understand the “caller’s intent" and offer “relevant solutions" that result in “greater call routing accuracy, reduced call duration and improved customer satisfaction", according to the bank’s press release. Kotak Mahindra has developed Keya in partnership with Nuance—a Nasdaq-listed firm. Similarly, online travel portal Yatra.com has its Yatra Universal Virtual Assistant (YUVA), which allows users to use both voice and text to communicate and complete bookings. The AI bot supports Indian accents. Yatra claimed in a 3 April press release that users “can provide the complete information in a single sentence or talk to YUVA and provide the relevant information in a form of a communication". Similarly, 24/7 Customer Inc.’s AIVA Assistant uses NLP to allow companies to build a knowledge base and integrate the same with its IVR. Keya, Eva, YUVA and AIVA are simply cases in point. A total of 31% of global smartphone owners reported using voice tech at least once a week, according to Statista, a provider of market and consumer data. 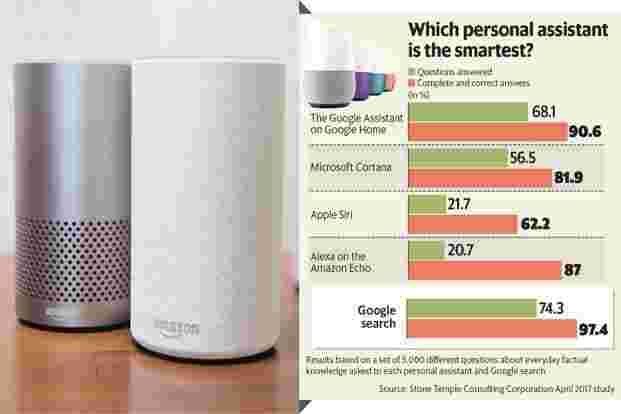 Further, voice assistants are making their presence felt in India with products like Amazon Alexa, Google Assistant, Apple Siri, Microsoft Cortana, Samsung Bixby and Jio Voice—all battling to garner a share of the voice market, not only as stand-alone devices like smart speakers but also by embedding bots in smartphones. This, even as an increasing number of consumers suspect that AI-powered voice-enabled personal assistants can pry on their conversations. According to Google, the Google Assistant is available on more than 400 million devices including speakers like Google Home, Android phones and tablets, iPhones, headphones, TVs and smart watches. “Your Assistant now gives you the power to voice control more than 1,500 compatible smart home devices from over 225 brands," says the Google blog. However, according to the 2018 Accenture Digital Consumer Survey of 21,000 consumers in 19 countries, digital voice assistants are more popular on standalone devices than those embedded in smartphones. The study, however, qualifies that while device adoption may be the easy part, keeping consumers engaged could be more challenging. Research firm Forrester concurs that Amazon’s Alexa will face a challenge to convince Google’s Android partners that it is a better alternative than Google’s own Assistant, and have them embed Alexa in devices beyond Amazon’s own Echo products. Jayanth Kolla, founder and partner of Convergence Catalyst, asserts that “building voice apps is slated to be the next big cottage industry in India". According to him, India has the world’s largest number of mobile app developers (about 3 million), and many of these developers are evolving to build voice- and speech-based apps and bots on established platforms such as Google Assistant, Amazon Alexa, Microsoft Cognitive Services. “And, Amazon’s AWS and Alexa teams are doing a great job in developing this ‘Voice Apps Developers Ecosystem’ and rallying them, with many freebies and incentives on their platforms," he says. Kolla points out that while some companies are building their voice apps on generic platforms offered by large companies such as Amazon Alexa and Google Assistant, a few companies are building their voice apps “along with speech recognition and NLP engines from ground up and collating the requisite training data sets specific to their requirements all by themselves". These smaller firms, he says, may not have the benefit of large training data sets, talent, refined machine learning and deep learning (ML and DL) engines, yet they provide specific voice/speech app platforms with specific data sets, keywords, NLP engines and DL algorithms catering to key industries such as banking, retail and healthcare. Kolla concludes that “we are in extremely early stages of voice- and speech-based apps ecosystem development, and there is no clear winner yet".